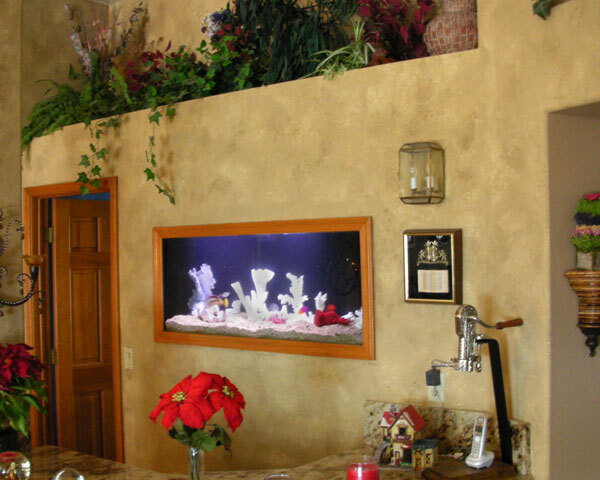 When building an aquarium system, selection of materials is key. Using better quality equipment makes the difference between an aquarium that's a source of pride and pleasure, and one that is a headache. 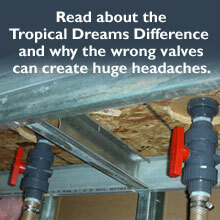 At Tropical Dreams, we use quality equipment built for long-term reliability and trouble-free maintenance. Two independent water filters and a water pump system ensure continual operation in the event of a water pump failure. A 1/2 horsepower water refrigeration and heater unit was also added to maintain the correct temperature for optimum fish health and color in the aquarium pictured above. For under gravel filter systems (closed systems), holes are drilled in the bottom of the aquarium and fittings and shutoff, or ball valves, are installed in the holes. Water flows down through the shutoff ball valves to the equipment below and returns up into the aquarium. This area is the most critical placement of quality ball valves. All commercial grade Tropical Dreams aquariums are designed using high quality, pressure tested, tru-union ball valves with fiberglass reinforced food grade vinyl tubing. When water filters are changed regularly, the water pump must first be turned off and water flow to the filter stopped. Ball valves accomplish this by turning the handles. Constant opening and closing of these valves without leaking is paramount, because if they leak, the complete aquarium contents must be removed, then replaced for repair. These valves are the most critical piece of equipment in any aquarium design; the insignificant extra expense for better quality valves ensures leak-free performance indefinitely. In addition, high quality tru-union ball valves can be disassembled to facilitate equipment changes if required, thereby reducing labor costs to the client. Most aquarium design companies do not use these high quality valves and opt for the inexpensive hardware store versions. Hardware store ball valves are very distinguishable by color and cost, they usually always have a white body with an orange handle and cannot be separated (non tru-union). These white ball valves are specifically made and labeled for outdoor use only and not intended for any indoor applications, especially under your aquarium. These ball valves should never be used in any aquarium filtration design. 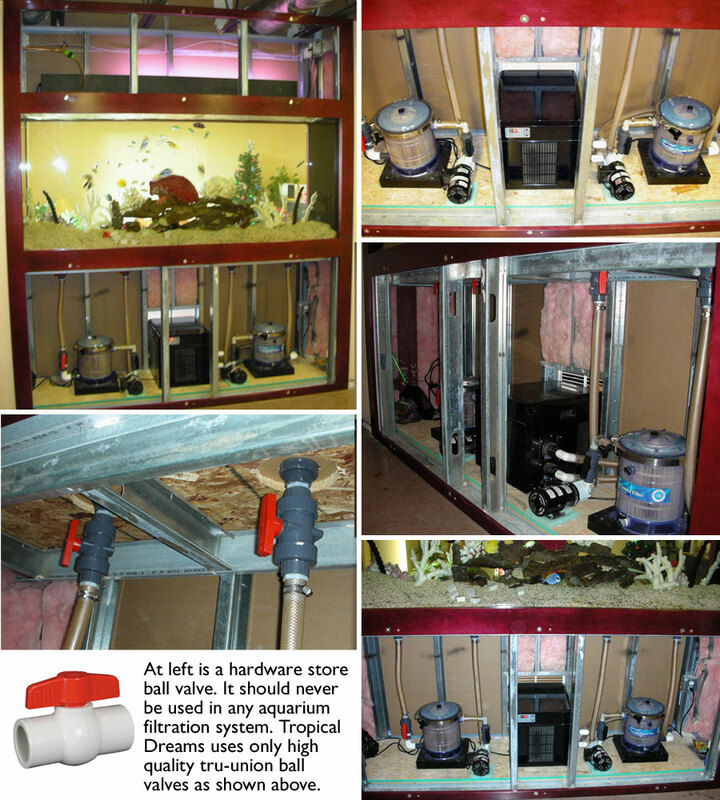 The following photos show equipment used in a residential client's 60-gallon saltwater aquarium and a commercial client's 350-gallon saltwater aquarium, both built into a wall. The water flow shut-off valves (tru-union ball valves) are grey with orange handles.